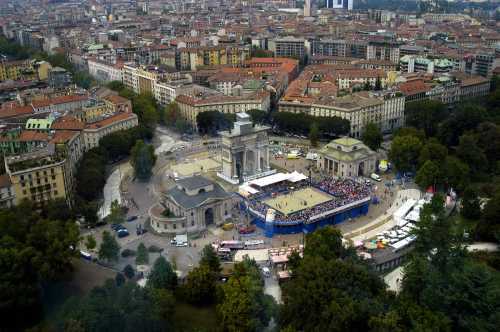 MILAN 2005 � With the Arco della Pace (Arc of Peace) - Parco Sempione as an inspirational setting for the elite women's teams, the Northern Italian city will host the women�s SWATCH-FIVB World Tour for the third-straight year. China� Jia Tian and Fei Wang won their first-ever �open� international gold medal in Milan by defeating two-time FIVB World Champions Adriana Behar/Shelda Bede in the 2003 final. Adriana and Shelda have appeared in every Italian �open� FIVB final as the Brazilians placed second to Lisa Arce and Holly McPeak in 1997 in Pescara before winning in Vasto in 1998. The best finish by an Italian team in those four events was fifths the past two seasons by Daniela Gattelli and Lucilla Perrotta in Milan. Italy also hosted women�s challenge events Vasto (1996), Porto San Giorgio (1999) and Portici (1999).